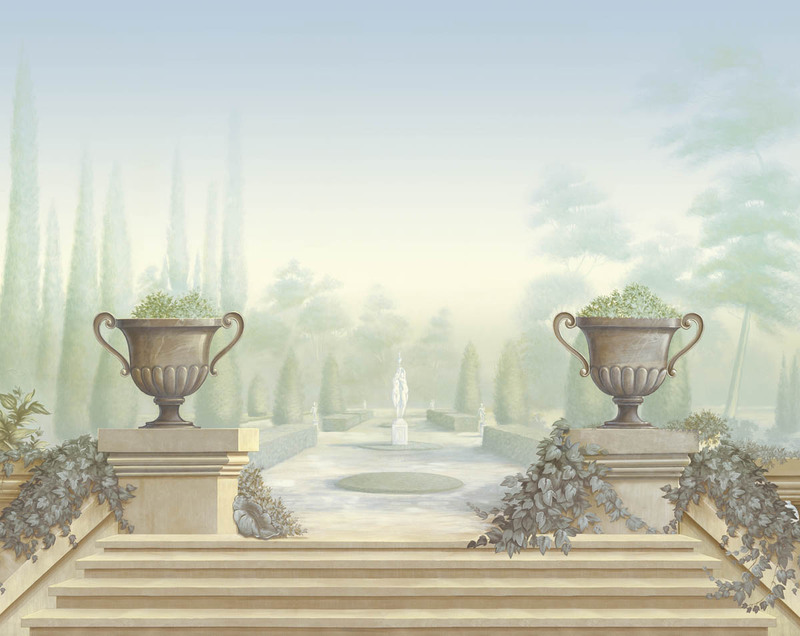 Panoramic murals are about as Romantic an idealized vision of nature as you can get. The section above is from a huge room wrap that I painted on canvas for a client in Europe. Except for the glaring errors in perspective (two horizon lines? seriously? ), I was really happy with the result, and jumped at the opportunity to produce a new mural based on the classic woodblock printed 'papier peint' Les Monuments De Paris, by Dufour et Cie (1814). The goal of these wonderful panels was "to stir emotions through the amazement and bewilderment at the "magical" effect of the spectacle of nature, experienced as a maze in which one gets delightfully lost" [Odile Nouvel-Kammerer]. 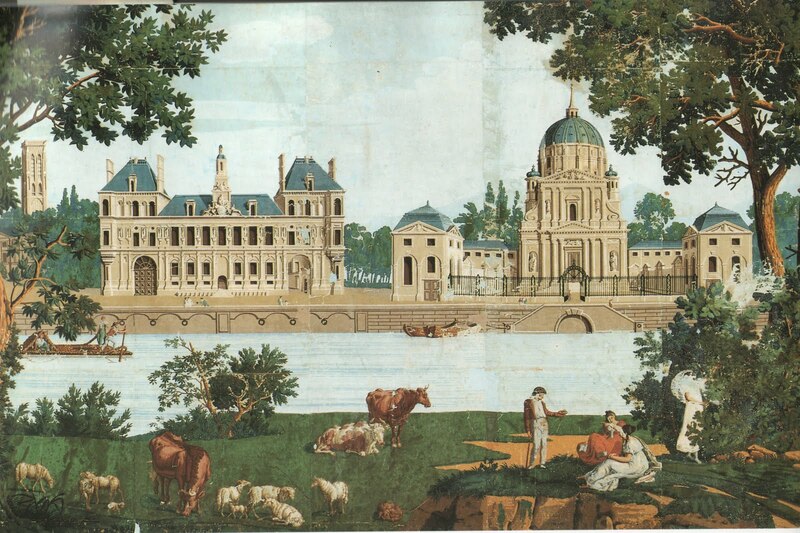 Les Monuments was a perfect example of an idealized vision of bucolic nature and artificiality. The buildings of Paris are unrealistically aligned beside each other, next to a perfectly horizontal river (the Seine, without a single bridge?!). You can easily picture the encircling effect created by the installed panels. You the viewer are sitting on an island refuge peopled by relaxing images of a Romanticized rural life, separated from the city in the background by a calmly flowing river. It's no wonder works like these from the manufactories of Dufour, Zuber and Desfossé were instantly popular. That's to say nothing of the extraordinary workmanship that went into their making. "In many cases, the same wood blocks which had been carved at the beginning of the century were still used for the papers produced at mid-century. In light of the huge investment in carving all those blocks, this made much economic sense. However, the French paper-stainers were aware of changing fashions and reflected those changes in their scenic papers. For example, The Monuments of Paris set was re-issued several times, and each time any significant new buildings in Paris were added and any which had been demolished were removed. " 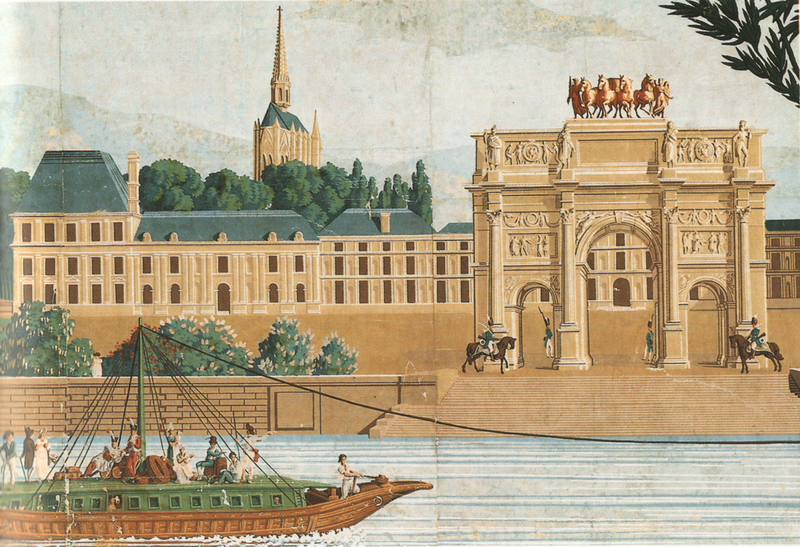 The catalog raisonné in French Scenic Wallpaper 1795-1865 shows one set of panels for Les Monuments, but the set I have included here has marked differences, and not just in the architecture. 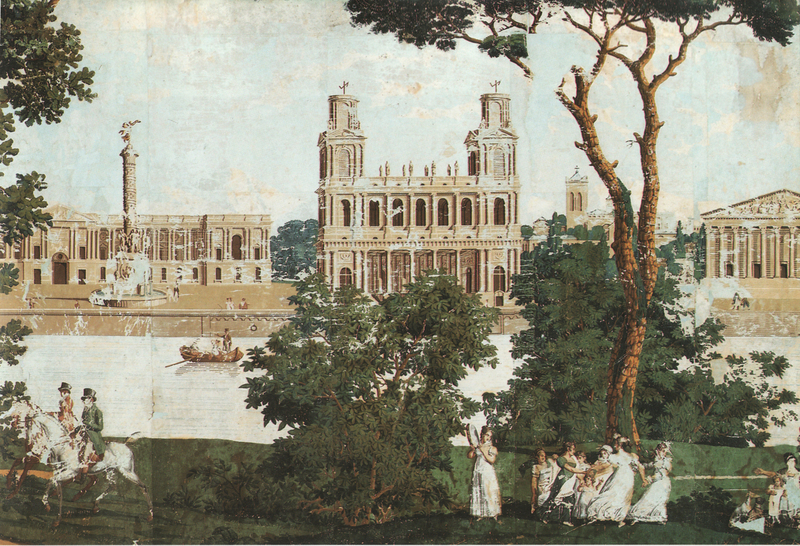 Figures on horseback, ladies strolling by the riverbank; a lot has changed. It was apparently common to make such detailed adjustments. "The small figures of the people strolling about the city were given new costumes in keeping with current fashions." "All the colour shades observed in [Les Monuments De Paris] were manufactured with the pigments red, iron oxide yellow, iron oxide Prussian blue, Scheele's green, raw sienna, burnt sienna, lead white, carbon black, vermilion (HgS), minium (Pb3O4), CaCO3"
Once completed, the panels had to be shipped. 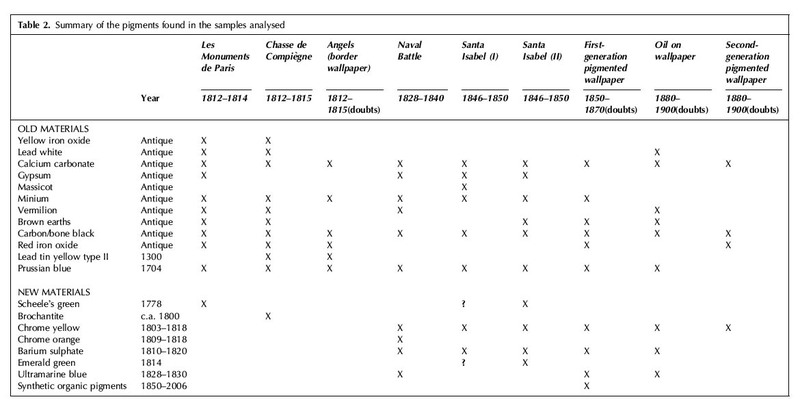 There was no Fedex in 1814. "Each set of papers intended for shipment abroad was very meticulously packaged. Once each roll was completed, it was carefully wrapped, first in paper and then in tin foil. All the rolls of the set were then placed in a water-tight container, usually a barrel, ready to be loaded aboard the ship which would carry them to the United States." Or wherever they were to be hung. I can imagine the horse-drawn carriage full of barrels of wallpaper crossing the Pyrenees and pulling up at some castle in the Basque country. According to Carolle Thibaut-Pomerantz (a veteran dealer in decorative papier peints), wood-block panels such as these are "an extraordinary feat in printmaking". Well we knew that, but how much do they sell for these days? That's what we really want to know. At last year's Palm Beach fair, Thibaut-Pomerantz sold a large panel from manufacturer Joseph Dufour's scenic "Monuments of Paris" (1812) for $65,000. In general, she notes, a fragment will go for $3,000 to $5,000, a good-size panel, $12,000 to $50,000; an exceptional, complete scenic can command as much as $200,000. Even at that price, she points out, they are "very affordable in relation to other works of art." Of course, they weren't always so pricey. In fact, they were developed through the first half of the Nineteenth Century as "an affordable alternative to tapestries or to the hand-painted fresco". Indeed, the Victoria and Albert Museum lists an original price of 50 Francs for the paper. My version is still in the planning and estimation stages, but I really hope this goes through. It's going to be a lot of fun to paint this! The last word goes to Ms. Kane: "What could be more soothing to the soul than a room in one’s home in which one could contemplate an idealized and perfect landscape?" How timely is your post, as I am starting mural this week using some of the elements of this very room set (and some from others, and some of my own invention) it is indeed a fun style to paint. No blending! It's harder than it looks. Cant wait to see your mural, I am sure it will be fabulous! Beautiful post Alan ...I also really love this painted wallpaper look, it has an incredible charm. I also hope you get this nice commission. It is a charming mural , this is what really matters. I particularly liked the black and white mural in panels for its "discontinuity", highly effective, impressive.. Crossing my fingers tightly that you get this. These kinds of commissions don't come along every day.....bonne chance! Fascinating! I did not realize there were revisions to update the architecture and fashions. 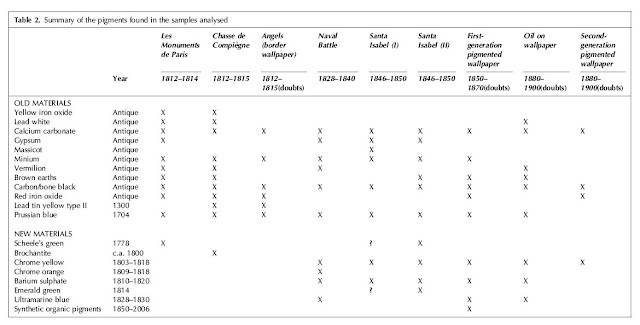 Great article and study of the "Monuments of Paris". I actually own an original, complete set (the full mural) of the reproduction commissioned by the MET in NY in 1980. It is vacuum-sealed in its original seal. This is the same reproduction that is on permanant display at the MET. It is 8 1/2 ft high by 48 ft in length and hand silk screened in full color. Amazing!